A new survey is in, and if you want your kids' Easter baskets to be a hit, DON'T buy this candy-- because it's been voted the worst ever. Not having kids, I didn't realize it, but Easter is a big holiday for candy. It makes sense, now that I think about it-- all those Easter baskets are filled with chocolate bunnies, eggs, Peeps and more. And according to this new survey from CandyStore.com, we'll spend about 2.49 billion dollars on candy this Easter. (Their survey quotes the National Retail Federation, who says that just about even with Halloween!) So, yeah, that's a lot of candy we're buying. But make sure you don't buy THIS candy this Easter, though-- because CandyStore says it's the worst. They surveyed 23,000 of their customers, including us here in the Land of 10,000 Lakes, and this one finished dead last. So what is the Worst East Candy? That'd be the Fluffy Stuff Cotton Candy Tails, a popular brand of packaged cotton candy. If you like cotton candy, the survey says, it's pretty good. But most people don't want cotton candy in the Easter Basket, apparently, but it finished dead last in the survey this year. 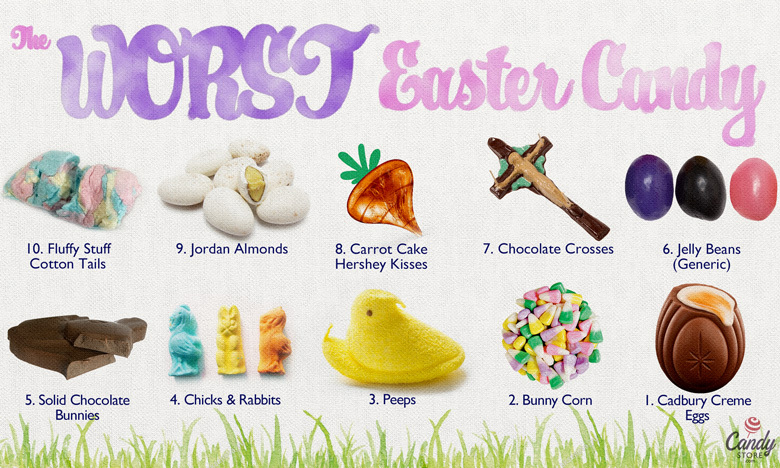 Other candies making the Worst East Candy list this year include Jordan Almonds (never heard of 'em), Carrot Cake Hershey Kisses, Chocolate Crosses, generic Jelly Beans (what?!? I loved them when I was a kid! ), solid Chocolate Bunnies (again, I loved these as a kid! ), Chicks & Rabbits Marshmallow Candies, Peeps Easter Candy, Easter Candy Corn, and Cadbury Creme Eggs.